Choosing a stationary phase is the most important step in selecting a column. Select the least polar phase that will perform the separation you require. Synonymous use of the terms polarity and selectivity is not accurate, but it is very common. 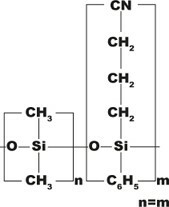 Selectivity is determined by the physicochemical interactions of the solute molecules with the stationary phase. Polarity is determined by the structure of the stationary phase. Polarity does have an effect on separation; however, it is only one of the many stationary phase properties that influence peak separation. Selectivity can be thought of as the ability of the stationary phase to differentiate between two solute molecules by differences in their chemical or physical properties. Separation is obtained if the interactions between the stationary phase and solutes are different. For liquid or gum stationary phase (polysiloxanes and polyethylene glycols), there are three major interactions: dispersion, dipole, and hydrogen bonding. The following is a simplified and condensed explanation of the interactions for polysiloxane and polyethylene glycol stationary phases. Always try to select the shortest column length that will provide the required resolution for the application. The resolution is proportional to the square root of the column efficiency. Therefore, doubling the column length will only increase the resolving power of the column by approximately 40%. 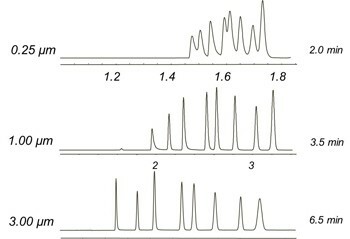 Fast column (0.1mm) are used for faster analysis because the same resolution can be achieved un a shorter time. For samples with a variation in solute concentration, a thicker film column is recommended. This will reduce the possibility of broad overloaded peaks co-eluting with other compounds of interest. If the separation of two solutes is sufficient and co-elution is still unlikely, even with large differences in concentration; then a thinner film can be used. As a rule, doubling the film thickness results in an increase in elution temperature of approximately 15-20° under isothermal conditions. Using a temperature program, the increase in elution temperature is slightly less.